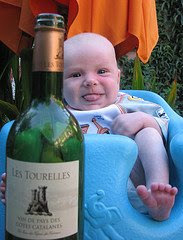 Today I just heard that two of my friends of OpenWineConsortium were new parents. Congratulations are in order and I send them heartily and happily! This happy event started me thinking on educating children and young ones about wine, wine making and vines. It is a recurrent theme around wine lovers and professionals. There was a very interesting thread in Eric Asimov’s blog, “The Pour”, a few weeks ago and it generated a LOT of comments. Instead of debating on how appropriate it is to have children have a drop or a taste of wine or champagne at the family table, I’d like to share with you some other ideas – as a wine educator. Wine is not only about drinking: it is also about culture, agriculture, nature and technology. Imagine you’re a little kid born and raised in a major city: what would you know about vines, seasons, the weather influencing the maturing of the grapes, grapes themselves? Not much, I assume! Imagine you’re a little kid born and raised in the countryside far away from vineyards: you wouldn’t know much more than your city friend. I’d like to reconcile every kid wherever they come from and have them share what is at the heart of the wine industry: teach them what vines are about, how they’re tended by people all year around, how they’re harvested and transformed over weeks and/or months to become our precious wine. I’d like to tell them you can make wine by just following nature’s course or adding technology. I’d like to walk them in vineyards and wineries. I’d like to have them talk to grape growers, wine makers and wine lovers of different countries and cultural backgrounds. I’d like to let them discover that wine, like music, is a great link between people, wherever they come from. I’d like them to understand that wine is a product of civilization and a sign of culture common to many – worldwide. How could this translate in reality? Every country should have a national program to teach kids about wine and food. But let’s start small, local: my friends, the Greek Women in Wine, are building a program, with their own Ministry of Agriculture and Ministry of Education, to teach children about vines, agriculture and grapes. Let’s all follow their example! Next post: Get "cork savvy"!